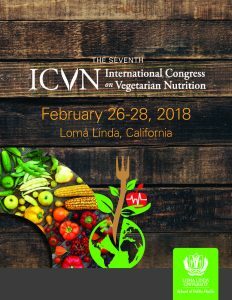 This page will provide you with a link to access information about the 3rd, 4th, 5th, 6th and now 7th International Congress on Vegetarian Nutrition and the proceedings that we derived from each of the four congresses. From there you will be able to view the program topics and also, abstracts for each session and information about the speakers. The 3rd Congress was held in March 1997 on the campus of Loma Linda University. Walter Willett gave the keynote address on “Vegetarian Diets: The Convergence of Philosophy and Science.” Thirty-four additional research presentations were given over the three days of the Congress. In addition, congress participants could choose from six workshops on the applications of vegetarian diets. The 4th Congress was an ambitious four days long, beginning April 9, 2002. Each day featured a Plenary Lecture that included David Jacobs speaking on “Nutrients, foods and dietary patterns as exposures for research: issues and challenges;” Joan Sabaté “The risk-to-benefit ratio of vegetarian diets: Changing paradigms;” Claus Leitzmann “Nutrition ecology: Contribution of vegetarian diets;” and David Jenkins “Diabetes prevention and management: Role of plant-based diets.” Fifty-four presentations were available to participants throughout the congress including symposia on current research and clinical issues, short oral lectures and panel discussions. 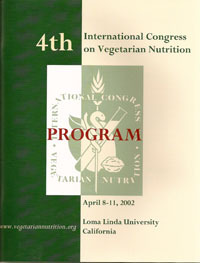 2008 marked the 5th installment of the International Congress on Vegetarian Nutrition. It continued to expand and offer cutting edge research and clinical information for the growing number of vegetarians world wide. The link provided on the website home page will give you an overview of the breadth of the program held at Loma Linda University on March 4-6, 2008. From there, other links will take you to information on the speakers and abstracts of the presentations. This edition of the Congress was held in conjunction with the annual Healthy People Conference, sponsored by the School of Public Health alumni. 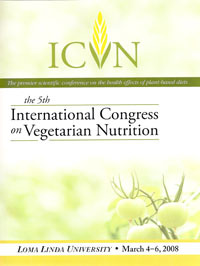 The 6th International Congress on Vegetarian Nutrition was held on February 24-26, 2013, at Loma Linda University. The vegetarian nutrition congress continues to be a premium scientific congress disseminating cutting edge knowledge and advances in the area of vegetarian nutrition, plant based diets and health outcomes that are relevant to both the person and the planet. The program was very comprehensive covering core public health issues such as chronic disease prevention using plant based diets to exploring the influence of meatless diets on the environment. A range of issues from basic science approach talking about the influence of plant based diets on the gut microbiome to epidemiological studies of large cohorts of vegetarians to practical and application of vegetarian diets were discussed. A highlight of this scientific congress was a debate between two scientists: Dr. William Harris and Dr. Thomas Sanders on the adequacy of n-3 fatty acids in the context of vegetarian diets: does type and source of n-3 fatty acid matter? The 7th Congress was held on February 26-28, 2018 on the campus of Loma Linda University Health. Frank Hu, David Katz and Joan Sabaté each provided a plenary address during the congress. 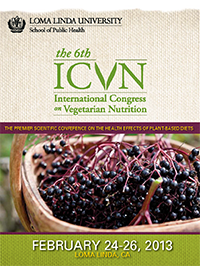 The theme of the scientific program for the 7thICVN is “Plant-based Nutrition for Personal, Population and Planetary Health.” View the program for 7ICVN. The proceedings of the First, Second, Third, Fourth, Fifth and Sixth International Congresses on Vegetarian Nutrition were published as supplements to the American Journal of Clinical Nutrition. For the last four a link is provided to take you to the AJCN website and the online Congress proceedings. 2013 marked the 6th installment of the International Congress on Vegetarian Nutrition. Mutch PB, Johnston PK, eds. 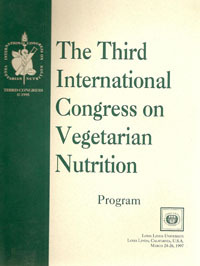 First International Congress on Vegetarian Nutrition: Proceedings of a congress held in Washington, DC, USA. Am J Clin Nutr, 48(3): 707-927, 1988 (Proceedings of this congress are not easily available at the AJCN website. Each article can be accessed individually at through this link.